Patricia née Jones had a certain fascination with foreign men; which is why she had married four of them over the years. First there was an Australian, then a man from Madagascar, then a Pole, and finally a cricket-playing gentleman from Sri Lanka. It was very confusing for herself and her children to have a mother with a different surname, especially when it came to school. And if each child had a different surname as well… goodness! how confusing! To streamline things, she simply hyphenated each surname each time she garnered a new husband. It made life a lot more straightforward, and one wonders why more people don’t adopt such an easy system for themselves and their children when they marry several times. 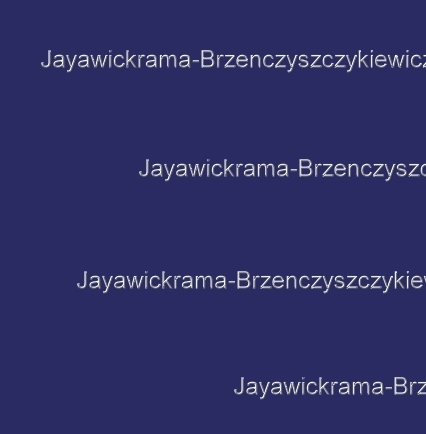 Certainly, Patricia Jayawickrama-Brzenczyszczykiewicz-Razafindrandriatsimaniry-Smith’s four children were grateful. (As were their teachers).